Kohlrabi is one of those vegetables that many of us don’t know what to do with. Most of us didn’t grow up eating it, so it’s really foreign to us. I’m in that same group. I had a request from a viewer to explore kohlrabi, so I have! Here’s one way I found to cook the bulb of kohlrabi. This simple recipe for sauteed kohlrabi is really easy and quick to make, and involves ingredients that you likely have on hand. Below is a video demonstration of the recipe with the written recipe below that. Enjoy! Remove the stems and leaves from the kohlrabi. Wash the bulb very well. Remove the peel and cut the kohlrabi into large cubes or bite-size pieces. Heat a skillet over just above medium heat. Add the olive oil (or water if preferred) and allow it to heat up briefly. If using fresh garlic, add the chopped garlic and allow it to heat through briefly. Add the chopped kohlrabi. Sprinkle with garlic powder (if using it), salt, pepper and cilantro or parsley to taste. Stir-fry the combo for a minute or so. Add one or two tablespoons of water and place the lid on the skillet. When the steam stops and the pan is almost dry (this happens quickly), stir the vegetables around and add a little more water; replace the lid. Repeat this process until they are just barely the desired crisp-tenderness that you like. Drizzle the lemon or lime juice over the mixture. Replace the lid and allow it to finish cooking, which shouldn’t take long…a minute or so. Taste and adjust seasonings, if needed. You can garnish with more cilantro or parsley, if desired. The entire process should take 10 to 15 minutes, depending upon the size of the kohlrabi pieces and the amount of tenderness you prefer. Note: This dish is best eaten when freshly made. *If you prefer to use no oil, just use water instead. 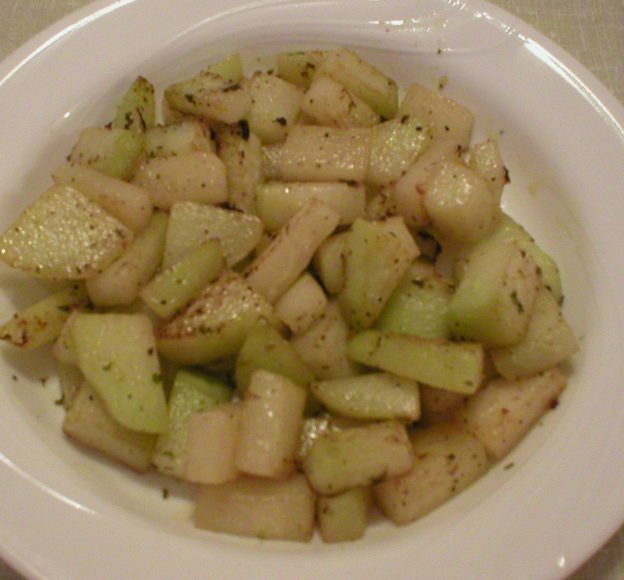 This entry was posted in Food and tagged how to cook kohlrabi, kohlrabi recipes, simple sauteed kohlrabi, what to do with kohlrabi on January 23, 2019 by Judi. Wondering what to do with kohlrabi and the greens? Here’s a very EASY recipe for sauteed kohlrabi greens using simple ingredients. It cooks up quickly and makes a nice side dish with many meals. Below is the recipe, following by a video demonstration of cooking the greens. Below that is my video on the basics of kohlrabi. In it, I explain what it is, how to choose kohlrabi, store it, preserve it, and prepare it. If you haven’t tried it, then it’s time to explore this unusual vegetable. It’s a “2 for 1 deal” where you get delicious greens AND the bulb vegetable all in one! Remove the leaves and stems from three kohlrabi bulbs. Wash them well, then cut them into bite size pieces. Heat a skillet on just over medium heat. Add the extra virgin olive oil and allow it to heat briefly. Add the garlic and allow it to saute briefly, taking care not to burn it. Add the kohlrabi greens and 2 or 3 tablespoons of water. Add salt and pepper to the greens and a little more water if needed; stir to combine. Cover the skillet and allow the greens to steam until they reach the desired tenderness that you like, or about 15 minutes. IMPORTANT! Check them very often to be sure the pan does not run dry. Add small amounts of water as needed so the greens cook with a minimal amount of water. When the greens are done to your liking, drizzle with the lemon juice. Stir to combine and serve. * If you do not have lemon juice, a very small amount of vinegar of your choice may be substituted. Start with a small amount, 1 or 2 teaspoons (to taste with the greens) and add up to a total of 1 tablespoon of vinegar, if desired. 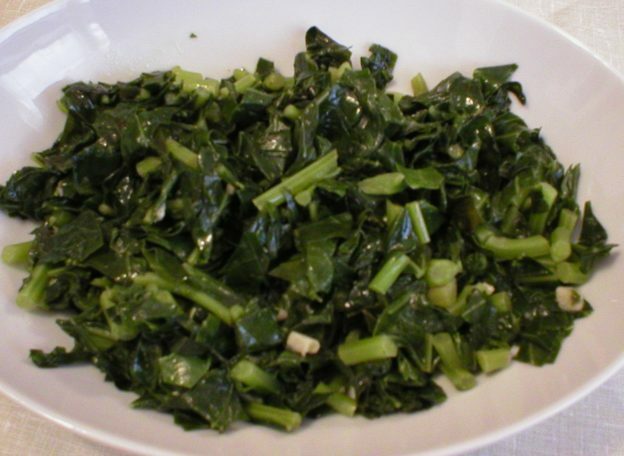 This entry was posted in Food and tagged how to cook greens, how to prepare kohlrabi greens, kohlrabi recipes, recipe kohlrabi greens, sauteed kohlrabi greens on January 18, 2019 by Judi.